Lindsay is a community of 20,354 people (2011 census) on the Scugog River in the Kawartha Lakes region of south-eastern Ontario, Canada. 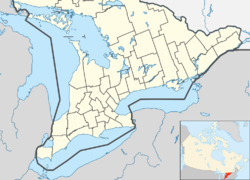 It is approximately 43 km (27 mi) west of Peterborough. It is the seat of the City of Kawartha Lakes (formerly Victoria County), and the hub for business and commerce in the region. The Township of Ops was surveyed in 1825 by Colonel Duncan McDonell, and Lots 20 and 21 in the 5th Concession were reserved for a town site. The same year settlers began to come to the region, and by 1827, the Purdys, an American family, built a dam on the Scugog River at the site of present-day Lindsay. The following year they built a sawmill, and in 1830, a grist mill was constructed. A small village grew up around the mills, and it was known as Purdy's Mills. In 1834, surveyor John Huston plotted the designated town site into streets and lots. During the survey, one of Huston's assistants, Mr. Lindsay, was accidentally shot in the leg and died of an infection. He was buried on the riverbank and his name and death were recorded on the surveyor's plan. The name Lindsay remained as the name of the town by government approval. Lindsay grew steadily and developed into a lumbering and farming centre. With the arrival of the Port Hope Railway in 1857, the town saw a period of rapid development and industrial growth. On June 19 of the same year, Lindsay was formally incorporated as a town. In 1861, a fire swept through the town and most of Lindsay was destroyed with hundreds of people left homeless. It took many years for Lindsay to recover from this disaster. In the late 19th century, local photographers Fowler & Oliver worked out of the Sunbeam Photo Gallery. It was also the home to Sir Samuel Hughes, the Canadian Minister of Militia during the First World War. The Victoria Street Armouries were built during this time. In 2001 Lindsay's town government was officially dissolved and merged, with Victoria County into the new City of Kawartha Lakes. The first railway to arrive in Lindsay was the Port Hope, Lindsay & Beaverton Railway (PHL&B), originally chartered in 1846 as the Peterborough & Port Hope Railway. The first train arrived at the St. Paul and King Streets station (Lindsay’s first) on the east side of the Scugog River on October 16, 1857. In 1871 it continued on over the Scugog River across a swing-bridge, gained height on the west bank, and then headed west out to Beaverton. It was renamed the Port Hope Railway in 1869. Lindsay’s second railway began as the Fenelon Falls Railway in 1871, changing its name to the Lindsay, Fenelon Falls & Ottawa River Valley Railway, and then to the Victoria Railway. It reached and terminated at Haliburton in 1878. At its Lindsay end, it connected with the original Midland Railway route on William Street North at "Victoria Junction" in 1875, and its original Lindsay terminus was at the PHL&B/Midland station at St. Paul and King Streets. In 1877, it applied to the Town of Lindsay to extend its railway down Victoria Avenue to Glenelg Street to connect with the WPP&L (see below), where a brick station (Lindsay’s second) was built on Victoria Ave between Glenelg and Melbourne Streets to serve the two railways as a union station. Lindsay’s third railway was the Port Whitby & Port Perry Railway, extended from Port Perry to Lindsay in 1876, reaching Albert Street, Lindsay on June 15, 1877 as the Whitby, Port Perry & Lindsay Railway (WPP&L). In 1881, the Midland Railway acquired the neighbouring smaller railways and built two links important to Lindsay. One was between Wick (Blackwater) Jct., and Cresswell (Manilla Jct.) in early 1883 for a direct route between Lindsay and Toronto (hitherto via Lorneville Jct. ); and the other ("the Missing Link") between Peterborough and Omemee in late 1883, for a direct Lindsay – Peterborough connection (hitherto via Millbrook Jct.). In the meantime Bobcaygeon interests had applied for, and in 1890 obtained, a charter for the Lindsay, Bobcaygeon & Pontypool Railway (LB&P) from Burketon Jct. (west of Pontypool) on the CPR’s then main MontrealToronto line, north to Lindsay. Construction began in 1901, and the line opened in 1904. The LB&P ducked under the GTR at the Scugog River bridge, following the east bank of the river to a station at Caroline Street (Lindsay’s fifth). The last train to Bobcaygeon was in 1957. To commemorate the 150th Anniversary, a monument was carved in front of the old town hall on Kent Street, by chainsaw carver Gerald Guenkel, of Omemee. It shows the importance of locomotives to Lindsay’s history. The Lindsay Post was a twice-weekly newspaper (paid circulation Tuesdays, free Fridays) that is part of Osprey Media and owned by Quebecor Inc. (Sun Media) that operated as a daily until May 2007. Its history dates back more than 150 years Ceased operation on June 14, 2013. Kawartha Lakes This Week is a weekly newspaper owned by Metroland Media Group, a subsidiary of Torstar Corp. It publishes Thursdays, on a "volunteer payment" basis. The Lindsay Advocate is an online and glossy print magazine that began publishing in the fall of 2017. It added a glossy, monthly magazine in March, 2018. The Advocate states it is focused on the social and economic wellness of Lindsay and Kawartha Lakes. CKLY-FM plays a classic hits format branded as Bob FM. It was formerly known as 910 CKLY on AM. Peterborough's CBC affiliate CHEX-TV covers the region daily with its Newswatch news programs. The municipality also draws intermittent news coverage from CTV Toronto and A-Channel Barrie. Lindsay is in a humid continental climate zone with warm, humid summers and cold winters. The coldest temperature on average that Lindsay experiences in the winter is −31.4 °C (−24.5 °F). On occasion the first snowfall occurs earlier than November, though the snow usually melts within a short period of time. Temperatures start to increase again in late February and last from late-June to mid-September. The Ontario Ministry of Community Safety and Correctional Services operates the Central East Correctional Centre. Ross Memorial Hospital is the only hospital in Lindsay. It was founded on November 20, 1902 by James Ross, who died on September 20, 1913. On April 14, 2005 the hospital finished a major renovation. A new dialysis unit was opened in 2008. Through direction from the Hockey Hall of Fame the history of the world's oldest stick was traced through the Lindsay Public Archives to verify the stick was carved between 1852 and 1856 by Alexander Rutherford Sr. of Fenelon Township near Lindsay. This stick sold for $2.2 million at an auction. Scenes from the movies "A Christmas Story" (1983) and "A Cool Dry Place" (1998) were filmed in Lindsay. In 2001, Lindsay played host to an episode of the OLN Reality Series "Drifters: The Water Wars" as they passed through the Trent-Severn Waterway. The Kawartha Art Gallery, located on the 2nd Floor of the Public Library, is the only public art gallery in Lindsay, and by virtue of amalgamation, the City of Kawartha Lakes. It is the steward of a permanent collection of over 160 pieces, including pieces by A. J. Casson, Jack Reid, Robert Harris, and Norval Morrisseau. Lindsay has a 150th anniversary song, entitled A Song For Lindsay. It was written and performed by recording studio owner Bob May, and local high-school student/vocalist Bethany Rees. One of Lindsay's popular landmarks is the old burnt down mill. Carl Coulter, CFL player, won the Grey Cup with the Hamilton Tiger-Cats in 1999. Ron Ellis played for the Toronto Maple Leafs in the 1960s and 1970s, and was a member of Team Canada 1972 in the Summit Series. Leslie M. Frost (September 20, 1895 – May 4, 1973), Premier of Ontario from 1949 to 1961. First elected in 1937 to the Ontario legislature representing Victoria-Haliburton, he was known as "The Laird of Lindsay." He combined small town values with progressive policies to lead the province through the economic boom of the 1950s. Sir Sam Hughes, Minister of Militia for Canada during World War I was born and raised in Lindsay. Tyler Kyte, actor and musician, known for appearances in Instant Star and Popular Mechanics for Kids. Joey Lawrence, commercial photographer behind the Twilight movie posters. Fergus Patrick McEvay, former Catholic archbishop of Toronto. Joe Primeau played for the Toronto Maple Leafs in the 1930s. Ernest Thompson Seton (1860–1946), artist, naturalist and writer of realistic wild animal stories. The Thompson family arrived in Lindsay in 1866 from South Shields, England. They resided in the home they built on Stony Creek until 1870, when Seton's father, Joseph Thompson, secured employment in Toronto as an accountant. Jack Tunney, best known as an on-air authority figure for World Wrestling Entertainment in the 1990s made his second home in Lindsay, and died there in 2004. Other NHLers from the town include: Jeff Beukeboom, Don Maloney, Dave Maloney, Jamie Allison, Joe Junkin, Dave Roche, and Tom Thornbury. Ontario's former Department of Lands and Forests (now the Ontario Ministry of Natural Resources) ran one of its 17 forest fire districts from Lindsay. Formed in 1946 The Lindsay Forest Fire District served as the headquarters for the protection and study of forests in Haliburton, Victoria, Durham, Peterborough and Northumberland Counties. The Lindsay office was also responsible for the maintenance and manning of the 13 fire tower lookouts within its boundaries. The towerman's purpose was as an early detection to protect the local forests from fire. The district's towers included: Harburn, Bruton, Eyre, Glamorgan (Green's Mountain), Harvey, Cardiff, Digby, Lutterworth, Sherbourne (St. Nora), Dorset, Clarke (Ganaraska Forest), Haldimand (Northumberland Forest) and Methuen (Blue Mountain). When a fire was spotted in the forest a towerman would get the degree bearings from his respective tower and radio back the information to headquarters. When one or more towermen from other towers in the area would also call in their bearings, the forest rangers at headquarters could get a 'triangulation' read and plot the exact location of the fire on their map. This way a team of forest firefighters could be dispatched as soon as possible to get the fire under control. Most of these towers were put out of use in the late 1960s when aerial detection systems were put in place. ^ a b Statistics Canada (2015-11-27). "Population and dwelling counts, for Canada, provinces and territories, and urban areas, 2011 censuses - 100% data (Ontario)". Retrieved 2016-02-23. ^ "Ross Memorial Hospital - Historical Milestones". Retrieved 2009-06-28. ^ "Hockey stick billed as oldest ever nets $2.2 million". The Globe and Mail. December 22, 2006. Retrieved 24 November 2018. ^ "A Christmas Story (1983)". imdb.com. Retrieved November 23, 2018. ^ "A Cool, Dry Place (1998)". imdb.com. Retrieved November 23, 2018. ^ "Drifters: The Water Wars - Reality TV Series Launch". Stellick Marketing. Archived from the original on July 16, 2006. Retrieved 24 November 2018.